A year ago, I was introduced to MeeGo at the MeeGo Conference in Dublin. A Linux-based OS backed by Nokia and Intel, it was full of potential, designed to be the future of Linux for netbooks, tablets, smartphones and other embedded devices. Several thousand developers and hackers rejoiced at the free tablets Intel gave out to get MeeGo hardware into peoples' hands. Not long afterwards, that MeeGo was dead. MeeGo, as we saw it, died the moment Nokia announced that they were choosing Windows Phone as their future smartphone strategy. 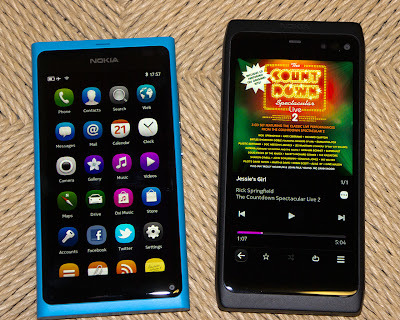 Nokia, in fact, was the most important proponent of MeeGo, as it was to be their saving grace in mobile; quite simply, if Nokia didn't make MeeGo succeed they were going to be history. Instead, Nokia chose plan B, switching to another platform entirely, leaving Intel with a massive project that they had neither the skills nor the will to complete. A few months after Nokia pulled out, Intel announced they were moving MeeGo development to a new web-based OS and leaving the rest to open-source maintainers. Yet Nokia still promised that they would create a 'MeeGo' smartphone. It would be their Qt halo device, the flagship phone for the development platform that was quickly becoming the primary platform for their Symbian devices. Expectations were high; photographs of prototype devices had leaked and the hardware was handsome - aluminum and glass, with a keen likeness to Apple's MacBook Pro. We expected a nerdy developer device with a moderately cool open source and hackable OS, a true successor to the N900. Instead, Nokia unveiled a "concept car", stunningly beautiful with an amazing OS that blends the gorgeous design and ease of use of iOS with a real, hackable, GNU/Linux core. This concept car was actually coming to market, and they called it the N9. 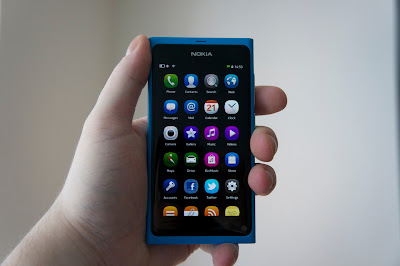 I've written about the N9 before, and what I think about the OS based on the N950 developer device I was given. Now, I have the final retail hardware on my desk, and it's every bit as awesome as expected. The polycarbonate unibody construction feels amazing in hand. What they characterize as an inky black screen looks phenomenal. What I expected to be a crummy door on the top (for the USB port and microSIM slot) is a really nice mechanism, solid with a spring to it. The microSIM door slides sideways and pops out in a really nice way. The speaker system fascinates me, as even when you cover the speaker entirely your music doesn't drop off in volume or muffle horribly - you won't accidentally silence video playback or games by covering it with your hand. It does indeed feel faster and more stable than the N950 developer hardware, and the software keyboard is way easier to type on. Accidental edge-swipes are less likely now with the curved glass screen, so the entire UI metaphor works wonderfully. In short, it takes your breath away. As a concept car, Nokia are only doing a limited run of N9s - 100,000 or so. Their MeeGo Harmattan OS is receding back behind the curtains, hopefully to return in another concept device in the future, whatever that may be. It sounds like Nokia is going to cannibalize Harmattan and bring a lot of this UI and design sense back to their non-smartphones with a new Linux-based OS called Meltemi. Indeed, the winds of change are blowing in the right direction. The N9 hardware design is being improved upon and re-used in Nokia's first Windows Phone device, the Lumia 800. I really believe Windows Phone was the right choice for Nokia (and that's why every app in our portfolio is either already ported to WP7, or soon will be). 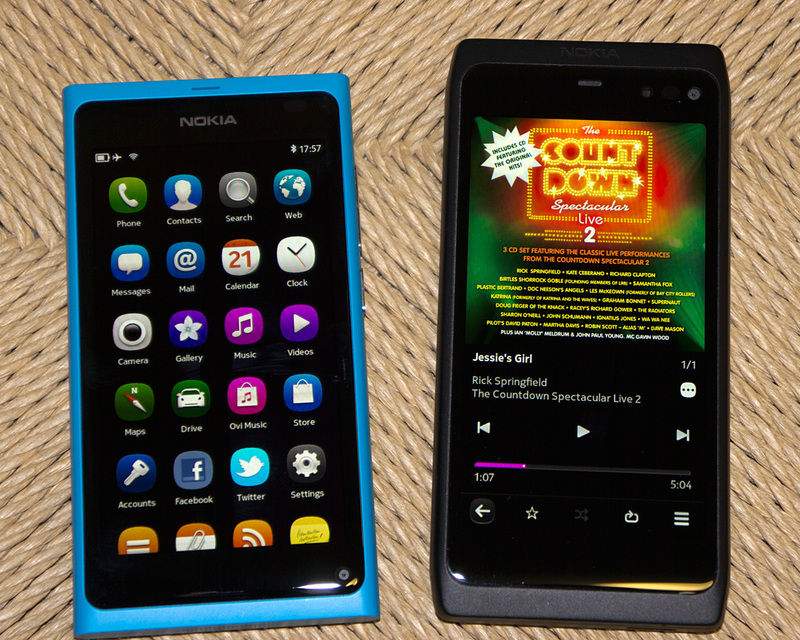 For now, MeeGo may be dead. Harmattan may never see the light of day again either. But I get to drive a concept car. For that, thank you, Nokia.